For other uses, see Prophet (disambiguation). In religion, a prophet is an individual who is regarded as being in contact with a divine being and is said to speak on that entity's behalf, serving as an intermediary with humanity by delivering messages or teachings from the supernatural source to other people. The message that the prophet conveys is called a prophecy. Claims of prophethood have existed in many cultures throughout history, including Judaism, Christianity, Islam, in ancient Greek religion, Zoroastrianism, Manichaeism, and many others. The English word prophet is a compound Greek word, from pro (in advance) and the verb phesein (to tell); thus, a προφήτης (profétés) is someone who foretells future events, and also conveys messages from the divine to humans; in a different interpretation, it means advocate or speaker. In Hebrew, the word נָבִיא (nāvî), "spokesperson", traditionally translates as "prophet". The second subdivision of the Hebrew Bible, TaNaKh (for "Torah, Nevi'im, Ketuvim"), is devoted to the Hebrew prophets. The meaning of navi is perhaps described in Deuteronomy 18:18, where God said, "...and I will put My words in his mouth, and he shall speak unto them all that I shall command him." Thus, the navi was thought to be the "mouth" of God. The root nun-bet-alef ("navi") is based on the two-letter root nun-bet which denotes hollowness or openness; to receive transcendental wisdom, one must make oneself "open". Cf. Rashbam's comment to Genesis 20:7. In addition to writing and speaking messages from God, Israelite or Jewish nevi'im ("spokespersons", "prophets") often acted out prophetic parables in their life. For example, in order to contrast the people’s disobedience with the obedience of the Rechabites, God has Jeremiah invite the Rechabites to drink wine, in disobedience to their ancestor’s command. The Rechabites refuse, wherefore God commends them. Other prophetic parables acted out by Jeremiah include burying a linen belt so that it gets ruined to illustrate how God intends to ruin Judah's pride. Likewise, Jeremiah buys a clay jar and smashes it in the Valley of Ben Hinnom in front of elders and priests to illustrate that God will smash the nation of Judah and the city of Judah beyond repair. God instructs Jeremiah to make a yoke from wood and leather straps and to put it on his own neck to demonstrate how God will put the nation under the yoke of Nebuchadnezzar, king of Babylon. In a similar way, the prophet Isaiah had to walk stripped and barefoot for three years to illustrate the coming captivity, and the prophet Ezekiel had to lie on his side for 390 days and eat measured food to illustrate the coming siege. The prophetic assignment is not always portrayed as positive in the Hebrew Bible, and prophets were often the target of persecution and opposition. God’s personal prediction for Jeremiah, "Attack you they will, overcome you they can't," was performed many times in the biblical narrative as Jeremiah warned of destruction of those who continued to refuse repentance and accept more moderate consequences. In return for his adherence to God’s discipline and speaking God’s words, Jeremiah was attacked by his own brothers, beaten and put into the stocks by a priest and false prophet, imprisoned by the king, threatened with death, thrown into a cistern by Judah’s officials, and opposed by a false prophet. Likewise, Isaiah was told by his hearers who rejected his message, "Leave the way! Get off the path! Let us hear no more about the Holy One of Israel!" The life of Moses being threatened by Pharaoh is another example. According to I Samuel 9:9, the old name for navi is ro'eh, רֹאֶה, which literally means "Seer". That could document an ancient shift, from viewing prophets as seers for hire to viewing them as moral teachers. Allen (1971) comments that in the First Temple Era, there were essentially seer-priests, who formed a guild, divined, performed rituals and sacrifices, and were scribes, and then there were canonical prophets, who did none of these (and were against divination) and had instead a message to deliver. The seer-priests were usually attached to a local shrine or temple, such as Shiloh, and initiated others as priests in that priesthood: it was a mystical craft-guild with apprentices and recruitment. Canonical prophets were not organised this way. Some examples of prophets in the Tanakh include Abraham, Moses, Miriam, Isaiah, Samuel, Ezekiel, Malachi, and Job. In Jewish tradition Daniel is not counted in the list of prophets. A Jewish tradition suggests that there were twice as many prophets as the number which left Egypt, which would make 1,200,000 prophets. The Talmud recognizes the existence of 48 male prophets who bequeathed permanent messages to mankind. According to the Talmud there were also seven women who are counted as prophetesses whose message bears relevance for all generations: Sarah, Miriam, Devorah, Hannah (mother of the prophet Samuel), Abigail (a wife of King David), Huldah (from the time of Jeremiah), and Esther. The Talmudic and Biblical commentator Rashi points out that Rebecca, Rachel, and Leah were also prophets.Isaiah 8:3-4refers he married "the prophetess", which conceived and gave to him a son, named by God Mahèr-salàl-cash-baz. Her name isn't elsewhere specified. Prophets in Tanakh are not always Jews. The story of Balaam in Numbers 22 describes a non-Jewish prophet. According to the Talmud, Obadiah is said to have been a convert to Judaism. The last nevi'im ("spokespersons", "prophets") mentioned in the Jewish Bible are Haggai, Zechariah, and Malachi, all of whom lived at the end of the 70-year Babylonian exile. The Talmud (Sanhedrin 11a) states that Haggai, Zachariah, and Malachi were the last prophets, and nowadays only the "Bath Kol" (בת קול, lit. daughter of a voice, "voice of God") exists. In Christianity, a prophet (or seer) is one inspired by God through the Holy Spirit to deliver a message. Some Christian denominations limit a prophet's message to words intended only for the entire church congregation, excluding personal messages not intended for the body of believers; but in the Bible on a number of occasions prophets were called to deliver personal messages. The reception of a message is termed revelation and the delivery of the message is termed prophecy. The term "prophet" applies to those who receive public or private revelation. 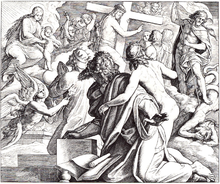 Public revelation, in Catholicism, is part of the Deposit of faith, the revelation of which was completed by Jesus; whereas private revelation does not add to the Deposit. The term "deposit of faith" refers to the entirety of Jesus Christ's revelation, and is passed to successive generations in two different forms, sacred scripture (the Bible) and sacred tradition. The Bible terms anyone who claims to speak God's words or to teach in his name without being a prophet a false prophet. One Old Testament text in Deuteronomy contains a warning against those who prophesy events which do not come to pass and says they should be put to death. Elsewhere a false prophet may be someone who is purposely trying to deceive, is delusional, under the influence of Satan or is speaking from his own spirit. Some Christians believe that the Holy Spirit gives spiritual gifts to Christians. These may include prophecy, tongues, miraculous healing ability, and discernment (Matthew 12:32 KJV "Whosoever speaketh a word against the Son of Man, it shall be forgiven him: but whosoever speaketh against the Holy Ghost, it shall not be forgiven him, neither in this world, neither in the world to come."). Cessationists believe that these gifts were given only in New Testament times and that they ceased after the last apostle died. New Testament passages that explicitly discuss prophets existing after the death and resurrection of Christ include Revelation 11:10, Matthew 10:40–41 and 23:34, John 13:20 and 15:20 and Acts 11:25–30, 13:1 and 15:32. The Didache gives extensive instruction in how to distinguish between true and false prophets, as well as commands regarding tithes to prophets in the church. Irenaeus, wrote of 2nd-century believers with the gift of prophecy, while Justin Martyr argued in his Dialogue with Trypho that prophets were not found among the Jews in his time, but that the church had prophets. The Shepherd of Hermas describes revelation in a vision regarding the proper operation of prophecy in the church. Eusebius mentions that Quadratus and Ammia of Philadelphia were both prominent prophets following the age of the Twelve Apostles. Tertullian, writing of the church meetings of the Montanists (to whom he belonged), described in detail the practice of prophecy in the 2nd-century church. A number of later Christian saints were claimed to have powers of prophecy, such as Columba of Iona (521-597), Saint Malachy (1094-1148) or Padre Pio (1887-1968). Marian apparitions like those at Fatima in 1917 or at Kibeho in Rwanda in the 1980s often included prophetic predictions regarding the future of the world as well as of the local areas they occurred in. Prophetic movements in particular can be traced throughout the Christian Church's history, expressing themselves in (for example) Montanism, Novatianism, Donatism, Franciscanism, Anabaptism, Camisard enthusiasm, Puritanism, Quakerism, Quietism, Lutheranism and Pietism. Modern Pentecostals and Charismatics, members of movements which together comprised approximately 584 million people as of 2011[update], believe in the contemporary function of the gift of prophecy, and some in these movements allow for idea that God may continue to gift the church with some individuals who are prophets. Some Christian sects recognize the existence of a "modern-day" prophets. One such denomination is The Church of Jesus Christ of Latter-day Saints (LDS Church), which teaches that God still communicates with mankind through prophecy. The Quran identifies a number of men as "Prophets of Islam" (Arabic: نبي‎ nabī; pl. أنبياء anbiyāʾ). Muslims believe such individuals were assigned a special mission by God to guide humanity. Besides Muhammad, this includes prophets such as Abraham (Ibrāhīm), Moses (Mūsā) and Jesus (ʿĪsā). A depiction of Muhammad receiving his first revelation from the angel Gabriel. From the manuscript Jami' al-tawarikh by Rashid-al-Din Hamadani, 1307, Ilkhanate period. Although only twenty-five prophets are mentioned by name in the Quran, a hadith (no. 21257 in Musnad Ahmad ibn Hanbal) mentions that there were (more or less) 124,000 prophets in total throughout history. Other traditions place the number of prophets at 224,000. Some scholars hold that there are an even greater number in the history of mankind, and only God knows. The Quran says that God has sent a prophet to every group of people throughout time, and that Muhammad is the last of the prophets, sent for the whole of humankind. The message of all the prophets is believed to be the same. In Islam, all prophetic messengers are prophets (such as Adam, Noah, Abraham, Moses, Jesus, and Muhammad) though not all prophets are prophetic messengers. The primary distinction is that a prophet is required to demonstrate God's law through his actions, character, and behavior without necessarily calling people to follow him, while a prophetic messenger is required to pronounce God's law (i.e. revelation) and call his people to submit and follow him. Muhammad is distinguished from the rest of the prophetic messengers and prophets in that he was commissioned by God to be the prophetic messenger to all of mankind. Many of these prophets are also found in the texts of Judaism (The Torah, the Prophets, and the Writings) and Christianity. Muslims often refer to Muhammad as "the Prophet", in the form of a noun. Jesus is the result of a virgin birth in Islam as in Christianity, and is regarded as a prophet. Traditionally, four prophets are believed to have been sent holy books: the Torah (Tawrat) to Moses, the Psalms (Zābūr) to David, the Gospel to Jesus, and the Quran to Muhammad; those prophets are considered "Messengers" or rasūl. Other main prophets are considered messengers or nabī, even if they didn't receive a Book from God. Examples include the messenger-prophet Aaron| (Hārūn), the messenger-prophet Ishmael (Ismāʿīl)) and the messenger-prophet Joseph (Yūsuf). Although it offers many incidents from the lives of many prophets, the Quran focuses with special narrative and rhetorical emphasis on the careers of the first four of these five major prophets. Of all the figures before Muhammad, Moses is referred to most frequently in the Quran. As for the fifth, the Quran is frequently addressed directly to Muhammad, and it often discusses situations encountered by him. Direct use of his name in the text, however, is rare. Rarer still is the mention of Muhammad's contemporaries. The Bahá'í Faith refers to what are commonly called prophets as "Manifestations of God" who are directly linked with the concept of Progressive revelation. Bahá'ís believe that God expresses this will at all times and in many ways, including through a series of divine messengers referred to as "Manifestations of God" or "divine educators". In expressing God's intent, these Manifestations are seen to establish religion in the world. Thus they are seen as an intermediary between God and humanity. The Manifestations of God are not seen as incarnations of God, and are also not seen as ordinary mortals. Instead, the Bahá'í concept of the Manifestation of God emphasizes simultaneously the humanity of that intermediary and the divinity in the way they show forth the will, knowledge and attributes of God; thus they have both human and divine stations. In addition to the Manifestations of God, there are also minor prophets. While the Manifestations of God, or major prophets, are compared to the Sun (which produces its own heat and light), minor prophets are compared to the Moon (which receives its light from the sun). Moses, for example, is taught as having been a Manifestation of God and his brother Aaron a minor prophet. Moses spoke on behalf of God, and Aaron spoke on behalf of Moses (Exodus 4:14–17). Other Jewish prophets are considered minor prophets, as they are considered to have come in the shadow of the dispensation of Moses to develop and consolidate the process he set in motion. In modern times the term "prophet" can be somewhat controversial. Many Christians with Pentecostal or charismatic beliefs believe in the continuation of the gift of prophecy and the continuation of the role of prophet as taught in Ephesians 4. The content of prophecies can vary widely. Prophecies are often spoken as quotes from God. They may contain quotes from scripture, statements about the past or current situation, or predictions of the future. Prophecies can also 'make manifest the secrets' of the hearts of other people, telling about the details of their lives. Sometimes, more than one person in a congregation will receive the same message in prophecy, with one giving it before another. Other movements claim to have prophets. In France, Michel Potay says he received a revelation, called The Revelation of Arès, dictated by Jesus in 1974, then by God in 1977. He is considered a prophet by his followers, the Pilgrims of Arès. A number of modern catholic saints have been claimed to have powers of prophecy, such as Padre Pio  and Alexandrina Maria da Costa. Several miracles and a vision of the identity of the last 112 Popes were attributed to Saint Malachy, the Archbishop of Armagh (1095–1148). Jehovah's Witnesses do not consider any single person in their modern-day organization to be a prophet. Their literature has referred to their organization collectively as God's "prophet" on earth; this is understood, however, in the sense of declaring their interpretation of God's judgments from the Bible along with God's guidance of His Holy Spirit. Their publishing company, Watch Tower, and official position magazine, The Watchtower, have asserted: "Ever since The Watchtower began to be published in July 1879 it has looked ahead into the future... No, The Watchtower is no inspired prophet, but it follows and explains a Book of prophecy the predictions in which have proved to be unerring and unfailing till now. The Watchtower is therefore under safe guidance. It may be read with confidence, for its statements may be checked against that prophetic Book." They also claim that they are God's one and only true channel to mankind on earth, and used by God for this purpose. They have made many eschatological forecasts, some of which have led people (including followers) to incorrect assumptions. One example is The Watchtower's assertions that the end of the "Gentile times" or "times of the nations" would occur in 1914; even prominent Watch Tower representatives such as A. H. Macmillan incorrectly concluded and overstated their expectations. As a result, The Watchtower has acknowledged that Jehovah's Witnesses "have made mistakes in their understanding of what would occur at the end of certain time periods." Concurrently with these exceptions, Jehovah's Witnesses in their literature and assemblies have taught their leadership was personally chosen by Jesus Christ in 1919 (a prophetic year in Jehovah's Witnesses eschatology) and that they are "God's sole channel on earth," and "Jehovah's spirit directed organization". Joseph Smith, who established the Church of Christ in 1830, is considered a prophet by members of the Latter Day Saint movement, of which The Church of Jesus Christ of Latter-day Saints (LDS Church) is the largest denomination. 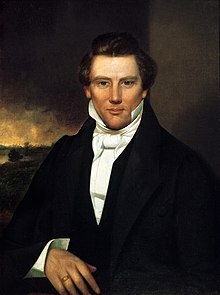 Additionally, many churches within the movement believe in a succession of modern prophets (accepted by Latter Day Saints as "prophets, seers, and revelators") since the time of Joseph Smith. Russell M. Nelson is the current president and prophet of The Church of Jesus Christ of Latter-day Saints. Baptist preacher William Miller is credited with beginning the mid-19th century North American religious movement now known as Adventism. He announced a Second Coming, resulting in the Great Disappointment. The Seventh-day Adventist Church, established in 1863, believes Ellen G. White, one of the church's founders, was given the spiritual gift of prophecy. The Branch Davidians sect evolved from the Seventh-Day Adventists Church. David Koresh, who died in the well-known Waco Siege in 1993, in 1983 claimed to be their final prophet and "the Son of God, the Lamb". Montanus, founder of Montanism an early Christian movement of the 2nd century. Mani, founder of Manichaeism, a quasi-Gnostic movement of late antiquity. Bernhard Müller, also known as Count de Leon, was a German Christian mystic. Emanuel Swedenborg, founder of Swedenborgianism, an 18th-century mystic movement. Hong Xiuquan, established the heterodox Christian sect "Heavenly Kingdom of Great Peace" (Chinese: 太平天國; Chinese: 太平天国). John Alexander Dowie, a faith healer who founded the city of Zion, Illinois, and the Christian Catholic Apostolic Church. Nona L. Brooks, described as a "prophet of modern mystical Christianity", was a founder of the Church of Divine Science. William M. Branham, Christian minister, usually credited with founding the post-World War II faith healing movement. Gerald Flurry, founder and head of the Philadelphia Church of God, who claimed he is 'that prophet' mentioned in John 1:21–22. The Ahmadiyya movement in Islam believes that Mirza Ghulam Ahmad was a non law-bearing Prophet, who claimed to be a fulfillment of the various Islamic prophecies regarding the spiritual second advent of Jesus of Nazareth near the end times. Nathan of Gaza was a theologian and author who became famous as a prophet for the alleged messiah, Sabbatai Zevi. The Hindu concept of rishis is similar to the concept of prophets. The Sanskrit word rishi is loosely translated into English as "seer" (a prophet, a man who can foresee the future). Hinduism recognizes and reveres thousands of rishis, who can be thought of as the collective founders of the Hindu religion over many millennia. Of these, special importance is given to the Saptarshi (the Seven Sages), widely regarded as patriarchs of the Hindu religion, whose listing is different according to different texts. The Saptarshi and their clans are believed to have composed the hymns of the four Vedas by entering into communion with the Supreme Cosmic Spirit through meditation. For instance, Rigveda 1.1 is attributed to Rishi Madhucchandā Vaishwāmitra (i.e. Madhucchandā of the clan of Vishwamitra). Most rishikās were male, but some were female too. Lopamudra is the author of one hymn in the Rigveda, and Gargi Vachaknavi is described in the Brihadaranyaka Upanishad as a highly respected woman in the field of Brahmajñāna. Apart from the Vedas, various rishis are also credited with composing the several Smriti texts, like Veda Vyasa who composed the Mahābhārata. Divination remains an important aspect of the lives of the people of contemporary Africa, especially amongst the usually rural, socially traditionalistic segments of its population. In arguably its most influential manifestation, the system of prophecy practiced by the Babalawos and Iyanifas of the historically Yoruba regions of West Africa have bequeathed to the world a corpus of fortune-telling poetic methodologies so intricate that they have been added by UNESCO to its official intangible cultural heritage of the World list. Tenrikyo's prophet, Nakayama Miki, is believed by Tenrikyoans to have been a messenger of God. Lou de Palingboer, founder and figurehead of a new religious movement in the Netherlands. Noble Drew Ali, Prophet and founder of the Moorish Science Temple of America, founder of the Moorish Divine and National Movement, 1913 AD, Newark N.J.
Rashad Khalifa, founder of the religious group United Submitters International (USI). Marshall Vian Summers, founder of the New Message from God religious movement. Emanuel Swedenborg, Swedish scientist, philosopher, theologian, revelator, and mystic. The Great Peacemaker (sometimes referred to as Deganawida or Dekanawida) co-founded the Haudenosaunee league in pre-Columbian times. In retrospect, his prophecy of the boy seer could appear to refer to the conflict between natives and Europeans (white serpent). From 1805 until the Battle of Tippecanoe that falsified his predictions in 1811, the "Shawnee prophet" Tenskwatawa lead an Indian alliance to stop Europeans to take more and more land going west. He reported visions he had. He is said to have accurately predicted a solar eclipse. His brother Tecumseh re-established the alliance for Tecumseh's War, that ended with the latter's death in 1813. Tecumseh fought together with British forces that, in the area of the Great Lakes, occupied essentially today's territory of Canada. Francis the Prophet, influenced by Tecumseh and Tenskwatawa, was a leader of the Red Stick faction of the Creek Indians. He traveled to England in 1815 as a representative of the "four Indian nations" in an unsuccessful attempt to get Great Britain to help them resist the expansionism of the white settlers. 20 years later (1832), Wabokieshiek, the "Winnebago Prophet", after whom Prophetstown has been named, (also called "White Cloud") claimed that British forces would support the Indians in the Black Hawk War against the United States as 20 years earlier (based on "visions"). They did not, and no longer he was considered a "prophet". In 1869, the Paiute Wodziwob founded the Ghost Dance movement. The dance rituals were an occasion to announce his visions of an earthquake that would swallow the whites. He seems to have died in 1872. The Northern Paiute Wovoka claimed he had a vision during the solar eclipse of January 1, 1889, that the Paiute dead would come back and the whites would vanish from America, provided the natives performed Ghost Dances. This idea spread among other Native American peoples. The government were worried about a rebellion and sent troops, which lead to the death of Sitting Bull and to the Wounded Knee massacre in 1890. Clifford Trafzer compiled an anthology of essays on the topic, American Indian Prophets. Trafzer, Clifford. American Indian Prophets: Religious Leaders and Revitalization Movements. Sierra Oaks Publishing Co. ISBN 9780940113022. In the late 20th century the appellation of prophet has been used to refer to individuals particularly successful at analysis in the field of economics, such as in the derogatory prophet of greed. Alternatively, social commentators who suggest escalating crisis are often called prophets of doom. Peels, H.G.L., & S.D. Snyman, The Lion Has Roared. Theological Themes in the Profetic Literature of the Old Testament, Eugene Oregon 2012. ^ p.1571, Alcalay. An alternative translation of this Hebrew word is derived from an Akkadian word "nabu," meaning to call. The Hebrew "navi" has a passive sense and means "the one who has been called" (see HALOT, p.661). ^ All the Parables of the Bible, Herbert Lockyer, Zondervan, 1963. ^ Jeremiah, Lamentations, Tremper Longman, Hendrickson Publishers, 2008. ^ Rashi on Genesis 29:34. ^ "1611 King James Bible: Book of Isaiah, chapter 8, verse 3-4". kingjamesbibleonline.org. Archived from the original on February 19, 2017. : "And I went unto the prophetess; and she conceived, and bare a son. Then said the LORD to me, Call his name Mahershalalhashbaz." ^ Ezekiel 13:3, "Thus saith the Lord GOD; Woe unto the foolish prophets, that follow their own spirit, and have seen nothing!" ^ Global Christianity: A Report on the Size and Distribution of the World's Christian Population, p. 67. See also The New International Dictionary, "Part II Global Statistics: A Massive Worldwide Phenomenon". ^ Wheeler, Brannon M. (2002-06-18). Prophets in the Quran: an introduction to the Quran and Muslim exegesis. Comparative Islamic studies. Continuum International Publishing Group. p. 8. ISBN 978-0-8264-4957-3. Retrieved 2011-01-29. There are 25 prophets mentioned by name in the Quran [...] Among those mentioned by name are: Adam (mentioned 25 times by name), Idris (1), Noah (43), Hud (7), Salih (10), Abraham (69), Ishmael (12), Isaac (17), Jacob (16), Lot (27), Joseph (27), Shuayb (11), Job (4), Dhu al-Kifl (2), Moses (137), Aaron (20), David (16), Solomon (17), Elijah (1), Elisha (2), Jonah (4), Zechariah (7), John (5), Jesus (25), Muhammad (4). ^ The militia – Page 100, James B. Whisker – 1992 "The work of Mohammed (569–632), commonly called the Prophet, the Koran was revealed in a series of visions over a period of many years beginning in 610"
^ Hutter, Manfred (2005). "Bahā'īs". In Ed. Lindsay Jones (ed.). Encyclopedia of Religion. 2 (2nd ed.). Detroit: Macmillan Reference USA. pp. 737–740. ISBN 0-02-865733-0. ^ a b Cole, Juan (1982). "The Concept of Manifestation in the Bahá'í Writings". Bahá'í Studies. monograph 9: 1–38. ^ "The Watchtower, Number 7, Vol. XCIII". 1972-04-01. Retrieved 2009-09-12. ^ Keep Yourselves in God's Love, 2008 Watch Tower, page 209, "Today, prophesying would apply to any Bible-based teaching that a Christian minister does." ^ “Would That All Were Prophets!”, Awake!, Watch Tower, June 8, 1986, page 9, "True Christians are prophets in that they teach others God’s Word"
^ Weaver, C. Douglas (2000). The Healer-Prophet: William Marrion Branham (A study of the Prophetic in American Pentecostalism). Mercer University Press. p. 173. ISBN 978-0253202215. ^ Larson, Bob (2004). Larson's Book of World Religions and Alternative Spirituality. Tyndale House Publishers. p. 79. ISBN 0-8423-6417-X. ^ "My Claim to Promised Messiahship". Review of Religions. ^ "Ruff sees more rough times ahead – MarketWatch". Retrieved 2009-04-09. Wikisource has the text of the 1911 Encyclopædia Britannica article Prophet. Wikimedia Commons has media related to Prophets. Etymology of the English word "prophet"
"Prophets, a Mormon Perspective". Mormon.org. Retrieved August 5, 2005. "Prophecy" . New International Encyclopedia. 1905.